The LP (from "long playing"  or "long play") is an analog sound storage medium, a vinyl record format characterized by a speed of ​33 1⁄3 rpm, a 12- or 10-inch (30- or 25-cm) diameter, and use of the "microgroove" groove specification. Introduced by Columbia in 1948, it was soon adopted as a new standard by the entire record industry. Apart from a few relatively minor refinements and the important later addition of stereophonic sound, it has remained the standard format for vinyl albums. Analog recording is a technique used for the recording of analog signals which, among many possibilities, allows analog audio and analog video for later playback. At the time the LP was introduced, nearly all phonograph records for home use were made of an abrasive (and therefore noisy) shellac compound, employed a much larger groove, and played at approximately 78 revolutions per minute (rpm), limiting the playing time of a 12-inch diameter record to less than five minutes per side. The new product was a 12- or 10-inch (30 or 25 cm) fine-grooved disc made of PVC ("vinyl") and played with a smaller-tipped "microgroove" stylus at a speed of ​33 1⁄3 rpm. Each side of a 12-inch LP could play for about 22 minutes. Only the microgroove standard was new, as both vinyl and the ​33 1⁄3 rpm speed had been used for special purposes for many years, as well as in one unsuccessful earlier attempt to introduce a long-playing record for home use by RCA Victor. Shellac is a resin secreted by the female lac bug, on trees in the forests of India and Thailand. 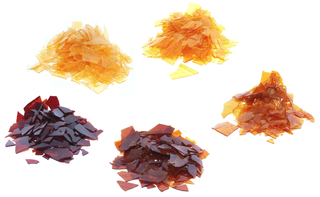 It is processed and sold as dry flakes (pictured) and dissolved in alcohol to make liquid shellac, which is used as a brush-on colorant, food glaze and wood finish. Shellac functions as a tough natural primer, sanding sealant, tannin-blocker, odour-blocker, stain, and high-gloss varnish. Shellac was once used in electrical applications as it possesses good insulation qualities and it seals out moisture. Phonograph and 78 rpm gramophone records were made of it until they were replaced by vinyl long-playing records from the 1950s onwards. Western Electric Company was an American electrical engineering and manufacturing company that served as the primary supplier to AT&T from 1881 to 1996, and to the local Bell Operating Companies until 1984. The company was responsible for many technological innovations and seminal developments in industrial management. It also served as the purchasing agent for the member companies of the Bell System. 35 mm film (millimeter) is the film gauge most commonly used for motion pictures and chemical still photography. The name of the gauge refers to the width of the photographic film, which consists of strips 34.98 ±0.03 mm (1.377 ±0.001 inches) wide. The standard negative pulldown for movies is four perforations per frame along both edges, which results in 16 frames per foot of film. For still photography, the standard frame has eight perforations on each side. A record press is a machine for manufacturing vinyl records. It is essentially a hydraulic press fitted with thin nickel stampers which are negative impressions of a master disc. Labels and a pre-heated vinyl patty are placed in a heated mold cavity. Two stampers are used, one for each of side of the disc. The record press closes under a pressure of about 150 tons. The process of compression molding forces the hot vinyl to fill the grooves in the stampers, and take the form of the finished record. The newton is the International System of Units (SI) derived unit of force. It is named after Isaac Newton in recognition of his work on classical mechanics, specifically Newton's second law of motion. Unfortunately for Victor, it was downhill from there. Many of the subsequent issues were not new recordings but simply dubs made from existing 78 rpm record sets. The dubs were audibly inferior to the original 78s. Two-speed turntables with the ​33 1⁄3 rpm speed were included only on expensive high-end machines, which sold in small numbers, and people were not buying many records of any kind at the time. Record sales in the US had dropped from a high of 105.6 million records sold in 1921 to 5.5 million in 1933 because of competition from radio and the effects of the Great Depression. Few if any new Program Transcriptions were recorded after 1933, and two-speed turntables soon disappeared from consumer products. Except for a few recordings of background music for funeral parlors, the last of the issued titles had been purged from the company's record catalog by the end of the decade. The failure of the new product left RCA Victor with a low opinion of the prospects for any sort of long-playing record, influencing product development decisions during the coming decade. Ten years after their introduction, the share of unit sales for LPs in the US was almost 25%, and of dollar sales 58%. Most of the remainder was taken up by the 45; 78s accounted for only 2% of unit sales and 1% of dollar sales. For this reason, major labels in the United States ceased manufacturing of 78s for popular and classical releases in 1956 with the minor labels following suit, with the final US-made 78 being produced in 1959. In 1952, Columbia Records introduced "extended-play" LPs that played for as long as 52 minutes, or 26 minutes per side. [ citation needed ] These were used mainly for the original cast albums of Broadway musicals, such as Kiss Me, Kate and My Fair Lady , or to fit an entire play, such as the 1950 production of Don Juan in Hell , onto two LPs. The 52-minute playing time remained rare, however, because of mastering limitations, and most LPs continued to be issued with a 30- to 45-minute playing time. A small number of albums exceeded the 52-minute limit. 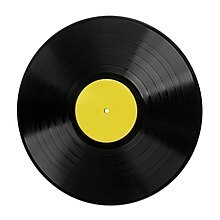 But these records had to be cut with much narrower spacing between the grooves, which allowed for a smaller dynamic range on the records, and meant that playing the record with a worn needle could damage the record. It also resulted in a much quieter sound. The list of long-playing vinyl records includes the 90-minute 1976 LP 90 Minutes with Arthur Fiedler and the Boston Pops , made by Radio Shack;  Genesis' Duke , with each side exceeding 27 minutes; Bob Dylan's 1976 album Desire , with side two lasting almost thirty minutes; Todd Rundgren's 1975 album Initiation , totaling 67 min 32 s over two sides; and André Previn's Previn Plays Gershwin,, with the London Symphony Orchestra, whose sides each exceeded 30 minutes. Finally, several recordings of Beethoven's Ninth Symphony were reissued on single discs; these LPs contained about 35 minutes on each side, with the third movement split into two parts. Spoken word and comedy albums require a smaller dynamic range compared to musical records. Therefore, they can be cut with narrower spaces between the grooves. The Comic Strip , released by Springtime Records in 1981, has a side A lasting 38 min 4 s and a side B lasting 31 min 8 s, for a total of 69 min 12 s.
The average LP has about 1,500 feet (460 m; 0.28 mi) of groove on each side. The average tangential needle speed relative to the disc surface is approximately 1 mile per hour (1.6 km/h; 0.45 m/s). It travels fastest on the outside edge, unlike audio CDs, which change their speed of rotation to provide constant linear velocity (CLV). (By contrast, CDs play from the inner radius outward, the reverse of phonograph records.) Thin, closely spaced spiral grooves that allowed for increased playing time on a ​33 1⁄3 rpm microgroove LP led to a faint pre-echo warning of upcoming loud sounds. The cutting stylus unavoidably transferred some of the subsequent groove wall's impulse signal into the previous groove wall. It was discernible by some listeners throughout certain recordings but a quiet passage followed by a loud sound would allow anyone to hear a faint pre-echo of the loud sound occurring 1.8 seconds ahead of time. This problem could also appear as post-echo, with a ghost of the sound arriving 1.8 seconds after its main impulse. Pre- and post-echo can be avoided by the use of direct metal mastering. In the 1970s, quadraphonic sound (four-channel) records became available in both discrete and matrix formats. These did not achieve the popularity of stereo records due to the expense of consumer playback equipment, competing and incompatible quad recording standards, and a lack of quality in quad-remix releases. Quad never escaped the reputation of being a gimmick, and the various (mutually incompatible) discrete surround solutions required an ultrasonic carrier signal that was technically difficult to capture and suffered degradation with playing. With the advent of DVD-Audio and Super Audio CD, multi-channel recordings once favored and championed by artists like Leopold Stokowski and Glenn Gould  have made a modest comeback. In addition, new surround recordings have been made for these formats and Blu-ray Audio. The composition of vinyl used to press records (a blend of polyvinyl chloride and polyvinyl acetate) has varied considerably over the years. 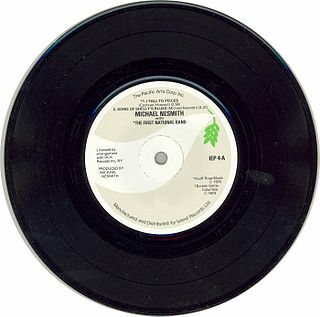 Virgin vinyl is preferred, but during the 1970s energy crisis, it became commonplace to use recycled vinyl. Sound quality suffered, with increased ticks, pops, and other surface noises. Other experiments included reducing the thickness of LPs, leading to warping and increased susceptibility to damage. Using a biscuit of 130 grams of vinyl had been the standard. Compare these to the original Columbia 12-inch LPs (ML 4001) at around 220 grams each. 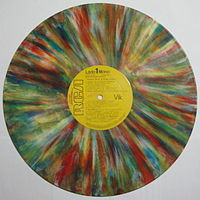 Besides the standard black vinyl, specialty records are also pressed on different colors of PVC/A or picture discs with a card picture sandwiched between two clear sides. 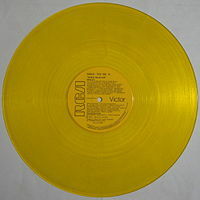 Records in different novelty shapes have also been produced. Disc jockeys (or DJs) in clubs still rely heavily on vinyl records, as cueing tracks from cassette tapes is too slow and CDs did not allow creative playback options until quite recently. [ when? ] The term "DJ", which had always meant a person who played various pieces of music on the radio (originally 78s, then 45s, then tape cartridges and reels; now cuts from CDs or tracks on a computer) – a play on the horse-racing term "jockey" – has also come to encompass all kinds of skills in "scratching" (record playback manipulation) and mixing dance music, rapping over the music or even playing musical instruments, but the original dance club (non-radio) definition was simply somebody who played records, alternating between two turntables. The skill came in subtly matching beats or instruments from one song to the next, providing a consistent dance tempo. DJs also made occasional announcements and chatted with patrons to take requests while songs were actually playing, similar to what radio disc jockeys have been doing since the 1940s. Mastering, a form of audio post production, is the process of preparing and transferring recorded audio from a source containing the final mix to a data storage device, the source from which all copies will be produced. In recent years digital masters have become usual, although analog masters, such as audio tapes, are still being used by the manufacturing industry, notably by a few engineers who have chosen to specialize in analog mastering. The Edison Diamond Disc Record is a type of phonograph record marketed by Thomas A. Edison, Inc. on their Edison Record label from 1912 to 1929. They were named Diamond Discs because the matching Edison Disc Phonograph was fitted with a permanent conical diamond stylus for playing them. Diamond Discs were incompatible with lateral-groove disc record players, e.g. the Victor Victrola, the disposable steel needles of which would damage them while extracting hardly any sound. Uniquely, they are just under ​1⁄4 in thick. Mobile Fidelity Sound Lab is a record label specializing in the production of audiophile recordings. The company is best known for its reissued vinyl LP records, compact discs, and Super Audio CDs but has also produced other formats. 6. Saving the file in the desired format. The source of the information for these steps is available from various websites and the help files for the software employed in the process. Highway Hi-Fi was a system of proprietary players and seven-inch phonograph records with standard LP center holes designed for use in automobiles. Designed and developed by Peter Goldmark, who also developed the LP microgroove, the discs utilized 135 grams of vinyl each, enough to press a then-still-standard 10-inch LP. SoundScriber is a dictation machine introduced in 1945 by The SoundScriber Corp.. It records sound with a groove embossed into soft vinyl discs with a stylus. Similar competing recording technologies are the Gray Audograph and Dictaphone DictaBelt. The machine can record 15 minutes of dictation on each side of a thin (.01-inch) flexible 6-inch vinyl disc spinning at a rate of 33 RPM, at a density of 200 grooves per inch. The discs originally cost about 10 cents each. The machine has two tonearms: a recording arm driven by a worm gear that creates the groove with a diamond stylus, and a pickup arm with a sapphire stylus for playback. A foot-operated playback/pause—and-reverse switch is used for transcribing. The Tefifon is a German-developed and manufactured audio playback format that utilizes cartridges loaded with an endlessly looped reel of plastic tape. It is somewhat similar like the later 4-track and 8-track magnetic audio tape cartridges, with grooves embossed on it, like a phonograph record. The grooves were embossed in a helical fashion across the width of the tape, in a manner similar to Dictaphone's Dictabelt format. The grooves are read with a stylus and amplified pickup in the player's transport. A Tefifon cartridge, known as a "Tefi", can hold up to four hours of music; therefore, most releases for the format are usually compilations of popular hits or dance music, operas and operettas. Tefifon players were not sold by television and radio dealers in Germany, but rather sold directly by special sales outlets affiliated with Tefi. 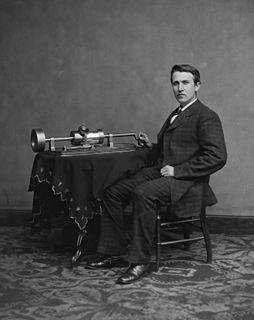 Electrical transcriptions are special phonograph recordings made exclusively for radio broadcasting, which were widely used during the "Golden Age of Radio". They provided material—from station-identification jingles and commercials to full-length programs—for use by local stations, which were affiliates of one of the radio networks. ↑ "Origin of LP". merriam-webster.com. ↑ "Full-length LP records on 150 and 180 gram vinyl". Standard Vinyl. Standard Vinyl. Retrieved December 18, 2018. ↑ "Frequently Asked Questions". 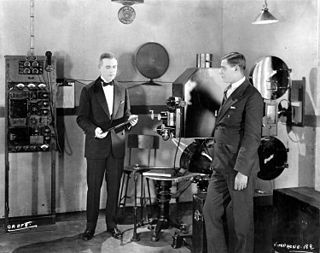 The Vitaphone Project. Retrieved 2011-08-12. ↑ "Rand's Esoteric OTR: Types of transcriptions and radio recordings". Randsesotericotr.podbean.com. Retrieved August 12, 2011. ↑ "Phonograph Disks Run for Half-Hour". The New York Times. September 18, 1931. p. 48. Retrieved November 25, 2012. ↑ Compton Pakenham (September 20, 1931). "Newly Recorded Music". The New York Times. p. X10. ↑ "Not So New", The Billboard , June 5, 1948, p. 17. 1 2 Robert Shelton (March 16, 1958). "Happy Tunes on Cash Registers". The New York Times. p. XX14. ↑ Goldmark, Peter. Maverick inventor; My Turbulent Years at CBS. New York: Saturday Review Press, 1973. ↑ "Columbia Diskery, CBS Show Microgroove Platters to Press; Tell How It Began", Billboard, June 26, 1948, p. 3. ↑ Marmorstein, Gary. The Label: The Story of Columbia Records. New York: Thunder's Mouth Press; p. 165. ↑ "78 Speed On Way Out; LP-45 Trend Gaining", The Billboard, August 2, 1952, p. 47. ↑ Kornelis, Chris (27 January 2015). "Why CDs May Actually Sound Better Than Vinyl". L.A. Weekly. 1 2 "Statistical Overview". riaa.com. Archived from the original on December 10, 1997. Retrieved December 31, 2016. ↑ McGeehan, Patrick (December 7, 2009). "Vinyl Records and Turntables Are Gaining Sales". The New York Times. Retrieved May 11, 2010. ↑ "Why Do Records Spin at 33 1/3 RPM?". The Sound of Vinyl Blog. ↑ "10-inch LP (1948 – 1980s) – Museum Of Obsolete Media". www.obsoletemedia.org. ↑ London Symphony Orchestra, Previn Plays Gershwin, André Previn, pianist and conductor (featuring Rhapsody in Blue, An American in Paris and the Concerto in F for Piano and Orchestra), Angel SFO 36810, circa 1979. ↑ "Pre-echo when recording vinyl record". Audacity Forum. Archived from the original (Forum Discussion) on 2009-06-09. ↑ "Analog Quadraphonic Formats" . Retrieved 8 April 2015. ↑ Adrian Hope (24 January 1980). "Pressing Problems for a Record Future". New Scientist. p. 229 ff. ↑ Hogan, Marc (April 11, 2018). ""High Definition Vinyl" Is Happening, Possibly as Early as Next Year". Pitchfork. Retrieved December 17, 2018. ↑ Seppala, Timothy J. (April 26, 2018). "HD vinyl is a promise, not a product". Endgadget. Retrieved December 17, 2018.